You can enjoy high-quality spa treatments while staying at this luxurious resort. Overlooking the Indian Ocean, the beautiful and cozy villas offer top-notch services. You must savor the amazing seafood served at the onsite restaurant. Indian cuisines are also served at the resort. Located in a beautiful location of Anse Louis, Maia Resort Seychelles is one of the best and prominent hotels of Dubai. With impeccable services and warm Seychellois hospitality, this 5-star rating property is ideal for families, honeymoon couples, and business travelers. The property features a fitness center, a sun deck, a swimming pool, a restaurant, a bar, and a kids club. With a beautiful combination of traditional artwork and modern amenities, the rooms at the hotel have contemporary furnishing and mood lighting. The staff members of the hotel offer 24 hours service and warm hospitality to its guests. Further, Seychelles International Airport is 6.3 km away from the property. Maia Luxury Seychelles features fully-furnished and well-appointed rooms that are equipped with all the modern amenities to provide a comfortable stay to its guests. There are 13 Ocean Villa and 17 Maia Signature Villa and guests can choose from them as per their preferences. With mood lighting and plush furnishing, the rooms at the hotel offer a luxurious stay. All the rooms have a spacious floor plan and are well-ventilated. The rooms are equipped with amenities to satisfy their guests. Some of the in-room facilities are deluxe bedding, air-conditioner, kitchenette, minibar, outdoor gazebo, TV with cable channels, and a fully furnished bathroom. These villas offer a beautiful view of the surroundings. Maia Luxury Seychelles offers a luxurious and comfortable experience to the guests. Maia Resort Seychelles offers a wide variety of services and modern facilities to provide comfort and convenience to its guests. 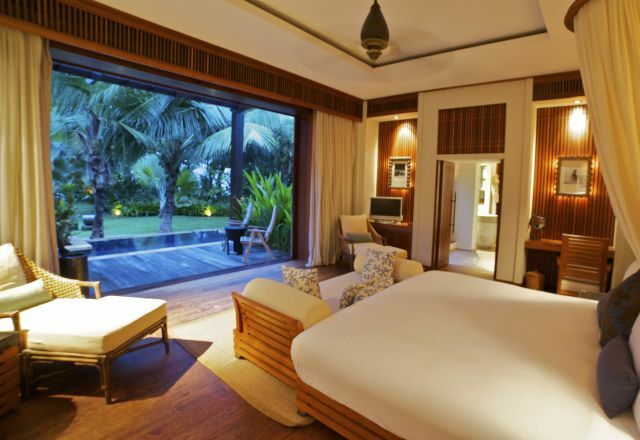 Inspired by modern lifestyle, the interiors of the rooms have wooden furnishing, neutral colors, and mood lighting. Guests can avail free Wi-Fi, free parking, daily maid service, laundry service, concierge service, luggage storage, tour desk assistance, currency exchange facility, babysitting facility, and 24-hour assistance at the front desk. The hotel maintains a swimming pool where guests can relax and rejuvenate and a sun deck where they can soak in the sun. Guests can enjoy spa service at the spa center and can perform the workout in the well-equipped fitness center. There is also a kids club, which is equipped with various games and play equipment. Further, the professional staff members of the hotel serve 24-hours. While staying at Maia Resort Seychelles, guests can enjoy a complimentary buffet breakfast every morning and can choose from Continental, English, and Irish cuisines. Moreover, the hotel also boasts an in-house restaurant, namely Tec-Tec. It is an all-day dining eatery that serves various scrumptious cuisines including Korean, Mediterranean, Middle-eastern, Vietnamese, Russian, French, Seychellois, and Singaporean. Guests can also avail private butler service during their stay. There is also an in-house bar in the hotel that serves an array of cocktails and mocktails to the guests. Also, the hotel arranges of romantic dinner of Barbeque upon request. Even, guests can get a chance of wine tasting while staying at the hotel. Yes, Maia Luxury Seychelles provides breakfast in-room facility to its guests. Yes, Maia Luxury Seychelles offers a car rental facility to all the guests. 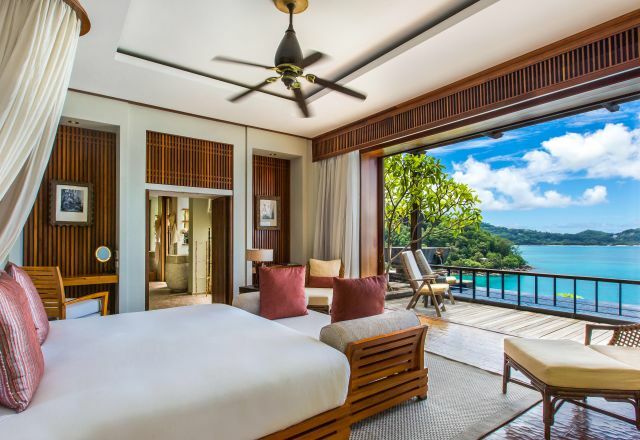 Yes, all the rooms at Maia Luxury Seychelles are air-conditioned. List some recreational activities offered by the hotel to the guests? Guests can enjoy cooking classes and live music performances. They can also indulge in various sports such as snorkeling, fishing, canoeing, hiking, water sports, etc. Yes, Maia Luxury Seychelles provides special diet menus to all the guests upon request. Maia Resort Mahe Seychelles is an impressive 5-star hotel and is situated in the beautiful location of Seychelles. With an easy access to the beach, it is an ideal accommodation space for families, business travelers, and honeymoon couples. Inspired by modern lifestyle, the interiors of the rooms have wooden furnishing, neutral colors, and mood lighting. The hotel also boasts a swimming pool where guests can relax and a sun deck where they can soak in the sun. Guests can relax at the spa center and can access the fitness center. Also, guests can savor delicious meals at the in-house restaurant and relish refreshing drinks at the bar. Guests can also get a chance of wine tasting during their stay and can also avail a personalized chef for the better experience. There is a kids club for the little ones too. The staff members of the hotel are professional serve 24-hours to fulfill the requirements of an individual. Guest can avail complimentary Wi-Fi, parking, concierge service, luggage storage, tour desk, currency exchange, 24-hour front desk, dry cleaning service, and laundry service. Maia Resort Mahe Seychelles is an ideal place to stay who want to create unforgettable memories.